Getting Married? Wondering how will it impact your health and life insurance needs? Getting married is exciting and a wonderful positive life event in one’s life. However, many couples can get overwhelmed by so many options in wedding planning that they do not find the time to sit down and think about critical questions in their joint life, with regard to planning their health and life insurance needs as a couple. Naturally, it is much more fun to taste the wedding cake than to pick a health insurance plan. I can completely relate to this. 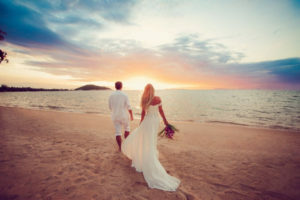 However, especially on the health insurance side, marriage triggers a qualifying life event, which allows you to make changes to your current health insurance, in a time frame of 30 up to 60 days, the period called the Special Enrollment Period. Both of you should inform your HR departments that you are getting married, and request from them a quote for yourself and your spouse on your current health plan options. Make a point also to review the Summary of Benefits, the provider networks, and the prescription formulary on each plan, if you take prescription medications. It might be that one of the employers even subsidize the payment of the health insurance premium of the spouse. Take the time to review this, as it might save you significant dollars, which you could use toward your future. If one partner receives an employer-sponsored health insurance plan, this will automatically disqualify the other partner from receiving a subsidy on Covered California or the Federal Exchange. To disregard this Affordable Care Act rule would mean that at the time of your next tax return, you might have to pay back the subsidy for the months after your wedding. So, make a point to review the cost of adding your fiancé onto your company health plan, and compare this to buying her/him health insurance on the individual health market. Surprisingly, the individual health insurance market is often times more competitively priced than the small group insurance market, however the networks and drug formulary might be smaller. In California, a family of two earning an adjusted gross income of under $63,000 will qualify for a subsidy over the state exchange in California through Covered California. I am a licensed agent with Covered California. I can help you to navigate their system and all health plan choices, and I will guide you through the often-challenging application process. Be advised that the “interim” situation of married filing separately is highly undesirable – under ACA laws, you are not able to receive subsidies with that tax filing status. If you are currently enrolled in Covered California or the Federal Exchange, make sure to update your status of being married as well as your tax filing status, so that you receive the correct subsidies and do not receive any tax surprises come tax season. If your income is higher than the $63,000 threshold, then it makes sense to buy health insurance directly on the individual insurance market. We at Solid Health Insurance Services will provide you with an overall quote of all insurance carriers and guide you to the health plan which best fits your new family needs. If you have life insurance in place, make sure to review the beneficiary and make the necessary changes so that your spouse will be added as beneficiary. Many young couples have no life insurance in place,and an affordable term insurance can give your new family situation peace of mind. Remember that your spouse will also be liable for the debts you incurred during the time of marriage. Make sure to be prepared should the unexpected happen. Whole life or universal life insurance are excellent vehicles towards saving for retirement, and possibly can provide you with tax-free income in your retirement age. I hope this information is helpful to you and wish you all the best for your joint future. All of this can seem challenging, at a time of change, so please do not hesitate to contact us at Solid Health Insurance Service. We will give you the knowledgeable,experienced, dependable and compassionate guidance you want and need, with an independent quote for all your health, life and long term care insurance needs.